We had Steve Johnson at our service a couple weeks ago. If you don’t know, Steve Johnson is a legend in our family of churches. Personally he has influenced me as an artist in tremendous ways. He cowrote the musical Upside Down. I remember seeing the original 4-hour version of the musical many times in my teen years and being so inspired by the story of the apostles and the early spread of the gospel, but also inspired by the arts and how they could so powerfully convey these stories. 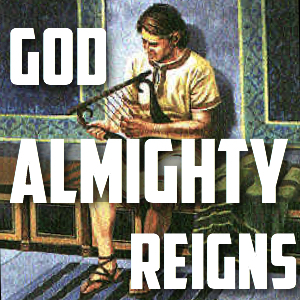 This song was written by Steve and Sherwin for a great musical about the story of David called Slingshot. This version has been simplified for congregational singing. It went great, and we sang it in another worship service since then. We’re gonna keep singing it. Here is a video of us learning the song. The sheet music is available in the Songs of the Kingdom songbook, and I’ve posted with chords below. Note: I took a couple liberties with the sheet music for our purposes, adding a chorus after the second verse, and adding an extra bar before the pre-chorus each time we do it. Also we sing the rhythm a little freely. See what you think! There is also a link to sheet music below, and capo chords if you want to play it the way I do. Great rendition of song! I played David in the play Slingshot which the song was written for.